The words Absolutely Amazing come to mind when I use this Baby Back Ribs, Tri Tip and Fennel Recipe. A few years ago we developed a series of dry rub for ribs recipes for Baby Back Ribs and Tri Tip. So we decided to proof our BBQ Sauce recipe by matching it up with World Famous Really Good Original Mild BBQ Sauce. We have to tell you the results of this barbecue were FANTASTIC! This Baby Back Ribs, Tri Tip and Fennel Recipe produces all the sumptuous flavors of parsley, garlic, tarragon, oregano, caramelized brown sugar and the licorice aromas of Fennel, not to mention the taste. So, follow along and create this recipe...who knows some day we may actually turn it into one of our mainstay products. Pour 1 Tablespoon of Fennel either whole or ground into a Cuisinart or similar blender. If using whole Fennel seed you may consider setting your blender to chop until the seeds have broken down to about 1/5 their size. Once the Fennel is blended open the 5 Oz container of Tri-Tip Rub and pour in with the Fennel. Continue blending the Tri-Tip Rub and Fennel together until thoroughly mixed. When done pour the Tri-Tip Rub and Fennel mixture back into the 5 Oz container. We'll be using the shake top on the 5 oz container to help us evenly spread the mixture. There are a couple of methods for flavoring prior to barbecuing on the grill. Before you add seasoning, be sure to remove the silvery membrane that runs along the bone-side of the ribs. The membrane is like a fibrous skin that will block the flavor of spices and from penetrating the meat. If you aren't comfortable trimming it yourself, ask your butcher to remove the membrane for you. If the ribs are a little fatty you can take a small sharp knife and cutaway portions of the fat exposing the rib meat. Over the years we've hundreds of slabs of ribs and we've tried both ways making them with the membrane on and making them with the membrane off. We have found conclusively that the ribs will develop better flavor when the membrane has been removed. The key to getting it removed is have the ribs at the right temperature when you perform the action. Always bring the ribs to normal room temperature when removing the film. If the ribs are cold just wait a while until they warm up a bit. If you choose to remove the skin when cold you will experience tearing. That means the films even though it comes off will most assuredly not come off evenly. Just allow the meat to warm up a bit then go about the business of removal. You will thank us once you experience the difference in time and temperature. Once all is ready place the ribs on either a large foil or wax paper sheet with material enough to fully wrap the ribs for holding. Place the ribs in a cool dry place in your refrigerator and hold for two (2) hours. This 2 hour time period allows the meat to rest mixing the natural juices of the meat with the dry rub which is drawn into the meat fiber. After 2 hours remove the meat and let rest on your counter or table until it reaches room temperature. **While the meat is holding and resting you can clean and prepare your grill as well as get condiments and sides in their early preparation and cooking stages. Once the baby back ribs have marinated in dry rub, and the grill is at the right temperature (see cooking chart below) begin cooking the ribs. Note, if you feel you need an additional sprinkling of our dry rub for ribs rub then go ahead and lightly dust the ribs. As for cooking I generally like to start cooking ribs with the bone side down. Typically that means that the curved side is up and the meaty side of the ribs is facing you. I do this because sometimes there might be a hot spot on the grill and if there is the meat will char right away ruining all the hard work and preparation you've done. So, once you place the ribs on the grill check back within 2 minutes to ensure that the temperature is right and that all is going well. If everything looks good, close the lid on the grill. I generally use grills with lids this allows the meat not only to grill but roast with heat coming from all sides ensuring that the meat is evenly cooked. Check back every 12-15 minutes turning the ribs over each time and after the 3rd checking begin to test the temperature of the ribs. Take a meat thermometer and insert it into the meaty portion of the ribs. Do not insert the thermometer from the top down, in most cases the meat will be pierced all the way through and you may actually be measuring the heat from the grill which will give you a false reading. Once the ribs have reach 5-10 degrees of their desired temperature lightly brush on Jake's Award Winning Original Mild BBQ Sauce recipe. Doing this will create a "wet" appearance to the ribs but will also enhance the flavors of the meat and dry rub. Now, adding the BBQ Sauce recipe is optional but I would suggest you cut your ribs in half then add BBQ Sauce recipe on one side and leave the other side as dry rub. When done remove and set aside in a lined container for 5 to 8 minutes, ribs will generally continue cooking for a few minutes then will be cool to just the right temperature for eating. Now that you've learned this unique BBQ Sauce recipe why not take a look at Jake's barbecue sauce and dry rubs used to enhance the flavor of these meats. It is important to “rest” meat before serving. In most cases beef contains mostly water about 75% combined with protein and fat. There are areas of the meat called myofibril structures which are actually minor pockets that make up the muscle fiber. While meat is grilled the proteins bond, dissolve and contract when expressed over heat. The reaction forces water out of the myofibrils causing the meat to shrink in size. When the meat is rested the proteins relax and much like a sponge the released water is allowed to reabsorb filling in the open spaces. The end result is a much more moist and juicy cut of meat. Baby Back ribs barbecues have been around pretty much as long as anyone can remember. We've found that the best rib recipes are those that compliment the actual flavors of the meat through the conspicuous use of salts, peppers, herbs and spices. The meat should be allowed to absorb or marinate in the combination of ingredients for as long as possible or as long is necessary. One should consider first what the desired taste profile will be before embarking on a journey of richly flavored marinades. And because of the myofibrils or pockets in the meat you'll want a marinade that further opens the pours as opposed one that reacts like an astringent with properties that will actually constrict the pores of the meat. It is for these reasons that we believe we have conquered the marinade formula. We also believe that our marinades and seasonings compliment meats while adding just the right amount of flavor profile in addition to the salts and peppers along with herbs and spices. For these reasons our tri tip, steak and rib rub and our Santa Maria Style bbq rub are such hits when it comes to products that you can buy. Each has their own level of salts, peppers, garlic and onion. Further, our tri tip, steak and rib rub is bolstered by a firm foundation of brown sugar providing a degree of subtle sweetness while enhancing the marinade process. For the avid barbecue consumer we've made a series of our products available for each purchase. 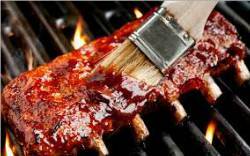 See our recipes and Dry Rub products to improve your experience around Baby Back Ribs. For great recipes on Tri Tip see our Tri Tip Dry Rub Recipes page. Serve with bacon wrapped baked or Dauphinois potatoes, broccoli, mac and cheese along with a generous helping or smoke apple pie for desert..